In this video you will see a test in which they hit the doors reinforced with Door Armor. They used everything from feet to cinder blocks. They could not force the door open. You will not find another door reinforcement kit tested to this extreme. It may seem like it’s happening more and more these days. Crooks kicking in doors, rushing at your house and stealing whatever they can get their hands on. But can highly touted item called EZ Armor (now Door Armor) prevent that from happening. We’re asking the tough questions tonight at WNEM TV5. Craig McMorris is putting the tool to the test. Unless the whole world is made of steel, I don’t think they can stop it. Ethelinda Taylor told TV5 team that her front door was kicked in by a crook. She wasn’t home at the time. They took money, some personal things. It traumatized her enough to move out of her house into another neighborhood. To lay down in my bed, somebody being in there, I’m always looking around, looking and hearing things, so I just decided to move. I thought they will come back again. 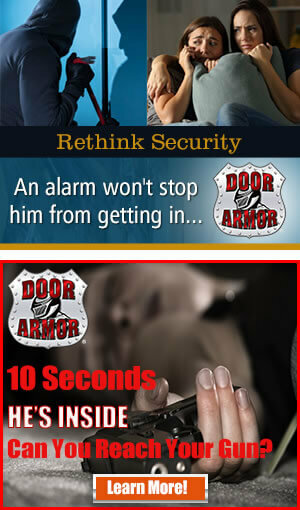 Every 12 seconds a home or apartment is broken into. 85% of the break-ins were through a door. Is you home safe with a deadbolt or an expensive alarm system? No. But there is some hardware out there advertised as way to keep the bad guys out. 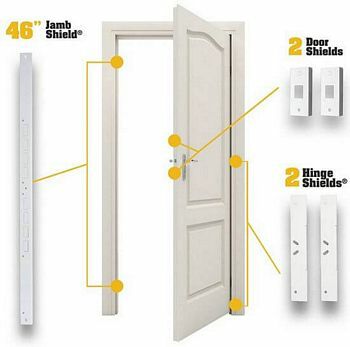 EZ Armor ultimate door security as a multi point metal protection for the door jamb and the lock area on the door and hinges. It goes for about $70 at your local hardware store. The item putted to the test with the help of police department. Township officials provided a couple of abandoned houses for a demo. TV5 assignment manager took less than 10 minutes to install EZ guard. He just inserted it on the inside door jamb and the door lock, not bothering with the hinges. Sergeant James Baker, all 6 feet 8”, 295 pounds of him, tried to kick in that door not once, not twice, not three times, but four times. Then gave up. It made him a believer. A lot of houses around here have old door jambs and something like that would reinforce it. I don’t think to many people would be able to kick in. Then we took the EZ guard off the door jamb and door. Watch how easy it was for sergeant Baker to knock down the door. We then went around to to the back of the house to test the EZ guard against the use of a concrete block. The manager installed most of the guard but since the door was metal, he couldn’t insert part of the guard over the door lock. The door wouldn’t shut, so we tried it the best we could. The door held with the first slam of the concrete block, then gave way with the second blow. We went to another house to once again try EZ guard. The manager installed it, he was able to use all the components on the door jamb and the door lock. Once again not reinforcing the hinges. He then used the log as a battering ram. After seven tries and smashing of the door knob, he gave up. Stopping this from happening with products like EZ Armor is also endorsed by the police chief of BV Township. Chief Brian Booker says with breaking and entering crimes on the increase, homeowners need to prepare themselves against it by utilizing a number of resources. Security locks, this product here which is good, lighting, neighborhood watches. There’s things you can do so you don’t get victimized. Like Ethelinda Taylor, who now thinks products like EZ Armor might be a good way for her to get some sleep at night. If you don’t want to buy an entire system here is the tip police tell us that you can also boost the security of your door by installing long screws into the door lock area of the door jamb. 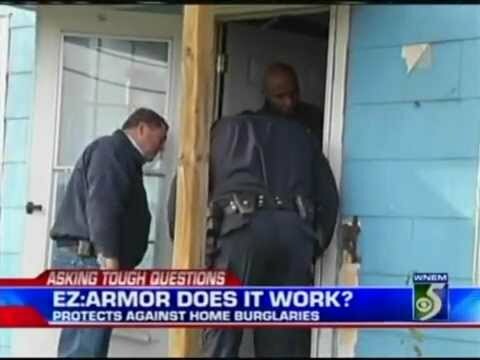 It wouldn’t provide the protection of a product like EZ Armor, but it will make it harder for the bad guys to break in.